One of my all around favorite laundry detergents is Tide. 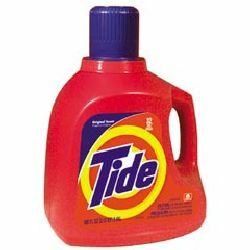 Over the years, I have used a multitude of different laundry detergents, but I always seem to go back to Tide. It is the only detergent that has consistently given me clean resultas. Another reason that I really like TIde is because it keeps all of my clothes soft. My favorite type of Tide detergent is “Tide with a Touch of Downy”. I love the way that it leaves my clothes smelling fresh and leaves my clothing fabrics so soft. There are a number of Tide detergents and I always have a couple in my house. “Tide with Bleach” and “Tide with Cold Water” are just some examples of other specific laundry detergent that Tide also manufactures. I highly recommend this detergent because it is a great stain remover. I found that in addition to the laundry detergent that the spot cleaner is also a great and handy tool. I would also recommend the Tide Stick. The stain fighter now comes in a stick form and can easily fit in a bag and be carried anywhere. If you ever spill anything on yourself, you can easily take out the stain fighting stick and quickly clean a stain that you might have on your clothes.